Have you been considering dental implants but aren't sure if they're the right option for you? 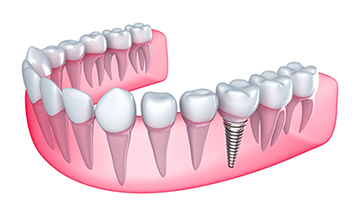 Implants offer benefits that other tooth replacement options don't. Dr. Jintae Park of JP Dental Care shares a few facts about dental implants. Because your implant integrates with the bone in your jaw, it becomes a permanent part of your mouth. During the first step in the implant process, your dentist creates a small hole in your jaw and places a titanium implant inside it. Titanium is the preferred implant material because the metal easily bonds to surrounding bone. Once the implant integrates with your jawbone, it provides a secure foundation for the crown that will be attached to it. Osseointegration usually takes about three to six months. After the implant fuses with the bone, your dentist will add an abutment, which will connect your new crown to your implant. A good fit is essential if you choose a bridge or partial or full dentures to replace a missing tooth or teeth. When these appliances don't fit well, painful gum irritation can occur when your bite and chew. Since implants become part of your jawbone, your new tooth is securely anchored in place and doesn't move. In fact, it feels very similar to the tooth it replaced. Your roots don't just anchor your teeth in your jaw. They also provide the constant stimulation your jawbone needs to stay strong. When you lose a tooth, the underlying bone begins to shrink or weaken because it no longer receives any stimulation. Eventually, facial sagging can occur due to changes in the jawbone, particularly if you've lost several teeth. Implants help keep your jawbone strong and prevent shrinking. Although implants may have a relatively high initial cost, the lifetime cost of a dental implant is usually actually lower than the cost of bridges and dentures. Since these appliances must be replaced periodically, you'll actually pay for them more than once. An implant only requires a one-time cost. Are you interested in improving your smile with dental implants? Call JP Dental Care in Reno, NV at (775) 853-0503 to learn more! We also serve Carson City and Sparks, NV.